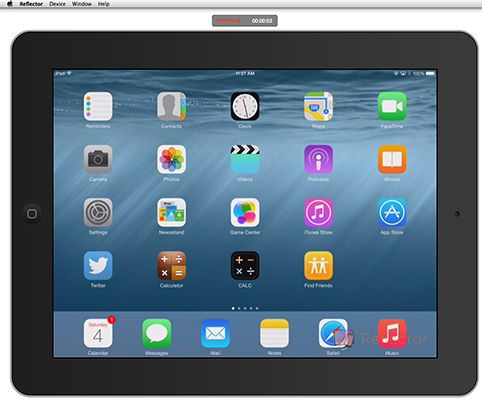 There are several ways to use your iPad’s screen with your Mac or Windows PC for work, as a second monitor or as a remote-control portal to the computer. And you can transmit what’s occurring on your iPad’s screen to a TV or projector using an Apple TV and iOS’s AirPlay functionality. But what if you want to record the screen activity, such as for a training or support video? There is, as they say, an app for that. Except that it’s not an iPad app. Squirrels (yes, that’s the company’s name) has the $12.99 Reflector app for your Mac or Windows PC that turns your computer into, well, sort of an Apple TV. When the app is running, it makes your computer appear in the iPad’s Control Center as another AirPlay destination in the AirPlay pop-over. Select the computer and turn on screen mirroring — boom! Your iPad screen now appears on your computer’s screen as a window. Reflector can record that computer screen — press Ctrl+R on your PC or Command+R on your Mac)—- to create a video recording. You can then edit that recording, as well as add a voice recording overlay, in your favorite video-editing app, such as Apple iMovie, Adobe Capture, TechSmith Camtasia, or Adobe Premiere.